SWAROVSKI ELEMENTS is the premium brand for the finest crystal elements manufactured by Swarovski. With more than a hundred years’ experience of high-quality craftsmanship and mastery in cutting, the company produces light-filled crystals of breath-taking range and brilliance. The dedication to perfection and innovation has been a cornerstone of Swarovski's policy since its foundation in 1895. Sunshine & Daisies have extended their own dedication to workmanship & are committed to only utilising crystals from this prestigious brand because we believe this is the quality our customers deserve. 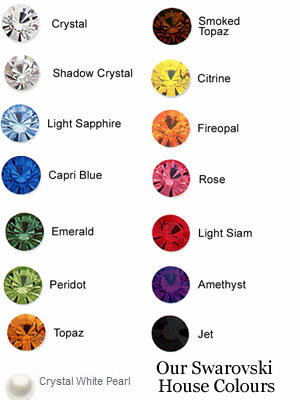 These are our House Swarovski Colours which are in stock at all times. Our standard sets of 6 wine glass charms are sent in the colours as indicated by the picture of each design. If you would like 2 sets of the same design but in 12 different colours, please indicate this in the customer notes section at checkout & we will select 12 different colours for you. If you would like specific colours, please do just let us know when you order. There may be a slight delay on the dispatch of your order, but there is no extra charge for colour alterations. Please note, if your product has options for a specific colour choice or if you choose a colour for alteration, they are made specifically for you & are therefore non returnable simply because you have changed your mind. They are also not covered by the Distance Selling Regulations due to the fact that you have requested the colour to be made.